SAP Innovation Day for Partners – A Resounding Success. One Day. Infinite Insights. Right from Your Desk. On February 27, SAP ran the fourth SAP Innovation Day for Partners. This innovative, virtual day was kicked off with a keynote from Adaire Fox-Martin, Executive Board member at SAP, joined by Arlen Shenkman, Head of Strategic and Service Partners, followed by keynotes from other Senior Executives in all SAP Lines of Business. This virtual day had a strong focus on the Intelligent Enterprise, helping our partners learn everything they need to know about SAPs strategy and position the messaging in 2019. Our special guest from The City Football Group spoke about their relationship with SAP, and how they use SAP software to help manage and drive their business. 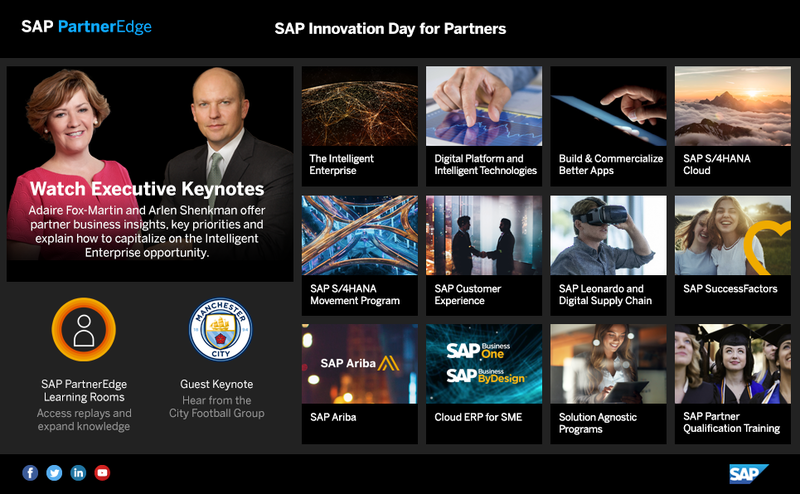 A full day of virtual keynotes and sessions, designed to enhance your knowledge, help you drive future success, and strengthen your partnership with SAP. Helen Dwight, VP Global Marketing at SAP, about why becoming an Intelligent Enterprise should be part of your client’s vision and roadmap and how becoming one should change your world for the better, driving increased purpose and benefit. SAP Analytics and Digital Platform: Chris Hallenbeck and guests discuss expanding business models, extending SAP technologies, monetizing intellectual property, and hyperscaling opportunities. SAP Ariba: a deep dive into the SAP Ariba 2019 Roadmap. SAP Business One and SAP Business ByDesign: Luis Murguia, Senior Vice President of the SAP Business One and SAP Business ByDesign field organization, about the momentum created by both ERP products and the new opportunity for 2019 and beyond. SAP Customer Experience: how SAP C/4HANA is driving into the Experience Economy and the best ways to engage. Bring Intelligence to your business with SAP Leonardo and connect digitally with SAP Digital Supply Chain portfolio of solutions. SAP S/4HANA Cloud: what Customer Success with SAP S/4HANA Cloud means for your organisation. SAP S/4HANA Movement Program: What’s in for partners. Support selling with Adoption Starter and conversion via SAP qualified packages for system conversions. SAP SuccessFactors: 2018 product highlights and insight into what is coming for 2019, as well as why “People” should be on the mind of every C-Level Executive, what they should care about most around HCM and how to engage in strategic “People” conversations to uncover HR transformation opportunities. Digital Supply Chain – Manufacturing and Industry 4.0: How SAP Digital Manufacturing can enable customers in the age of Industry 4.0 and the era of IoT/OT convergence, machine learning and the Customer of One. Industry Keynote: Lori Mitchell-Keller, Co-President of SAP Industries, outlined the SAP Industries mission to bring the Intelligent Enterprise to life. In case you missed this virtual event, all content from this successful day is now available to you on demand in our SAP PartnerEdge Partner Excellence Learning Room! Grab the opportunity to download and view all content here. 2. Select the SAP Partner Excellence Learning Room and click the “Access” button.